This time of year always finds my family enjoying Christmas themed activities during home preschool and intentional toddler time! I use Pinterest a lot for gathering ideas, but when it comes time to implement, I like to have all my ideas that I want to try in one place. 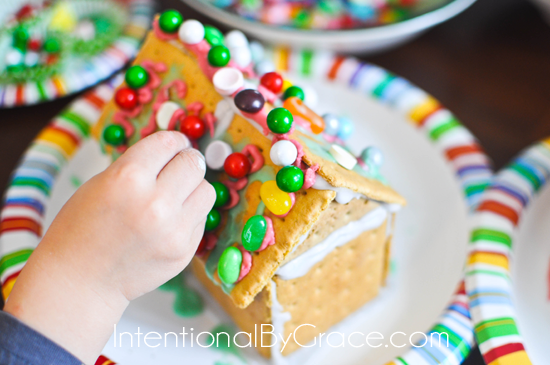 This post rounds up all the simple Christmas crafts, Christmas themed sensory play ideas, Christmas treats, and more for toddlers and preschoolers that I’ve been gathering up this year into one place. 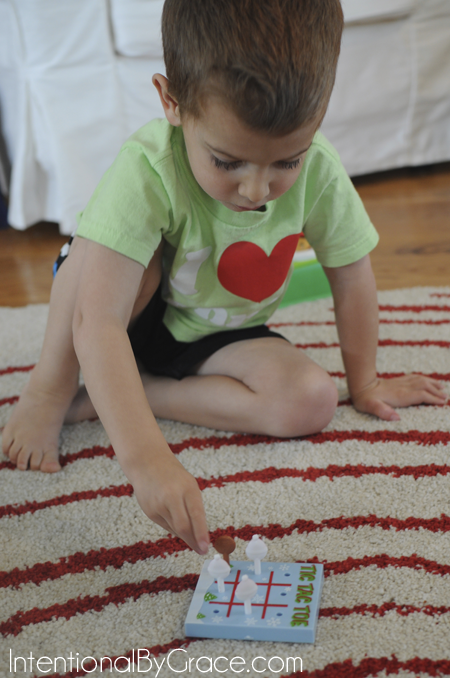 Sort of like my round-up of letter of the week crafts for preschoolers. It just makes things easier! 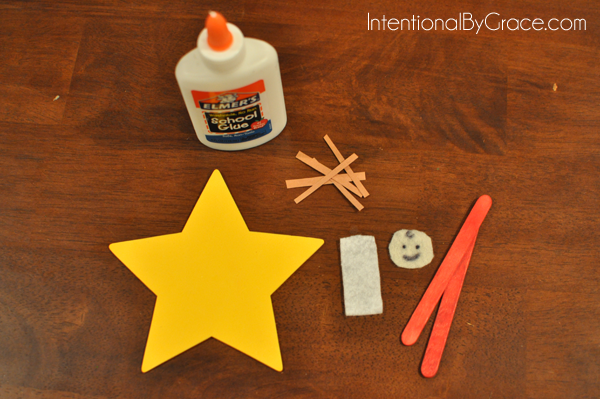 What you will find below are Christmas themed activities that I have done or plan to do with my two boys (ages: 15 months and 3.5 years old). I love when I find activities that both of my boys enjoy doing together. Yes it can get a little messy occasionally, but it is totally worth it. 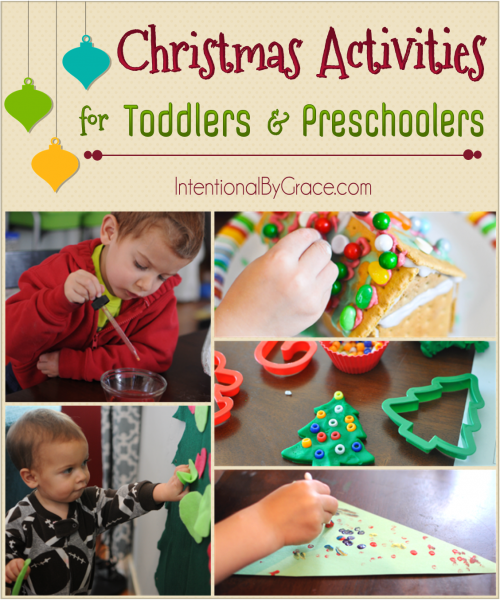 If you have toddlers and/or preschoolers in your house, then maybe this will give you some ideas for fun Christmas themed activities to do this year. 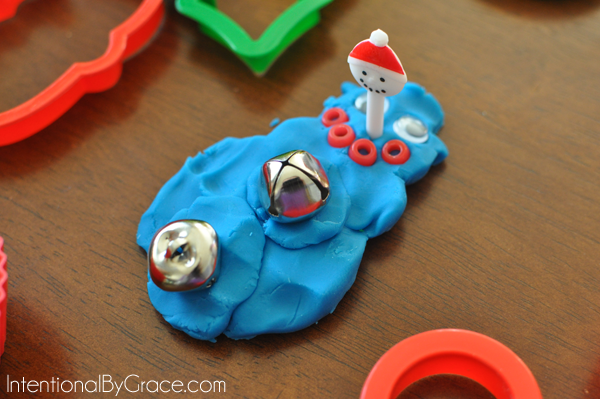 Baby in a Manger Ornament – This ornament is super simple to make. 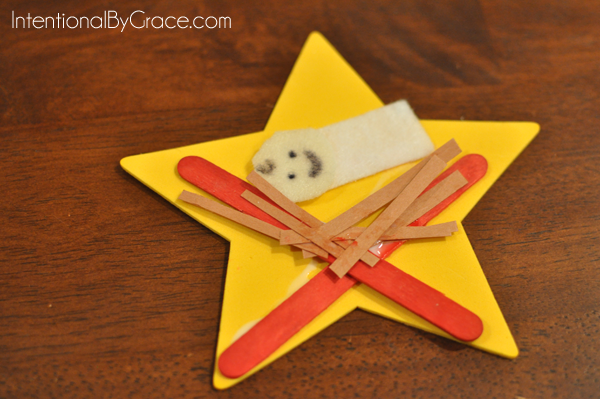 You need a foam star (or star cut out from card stock), popsicle sticks, brown construction paper, felt for Jesus’ body, glue, scissors, and sharpie marker. 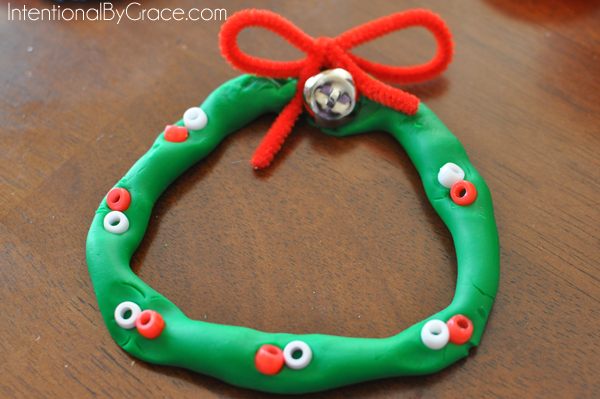 Make Salt Dough Ornaments – I googled a salt dough ornament recipe and we spent an afternoon making some fun creations! 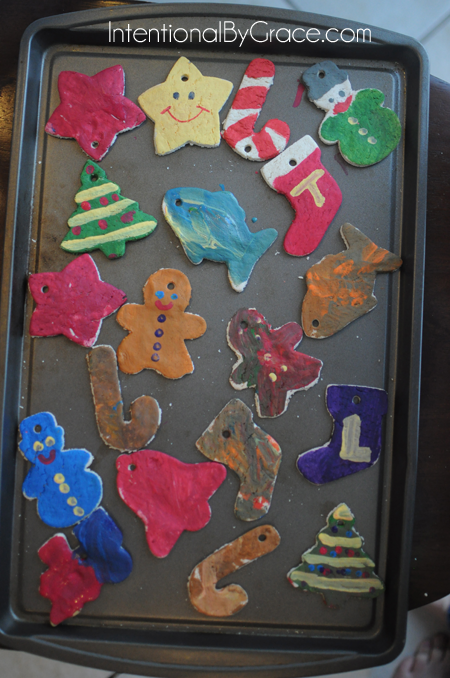 We handed several ornaments out as gifts and party favors for our Gingerbread House Party. 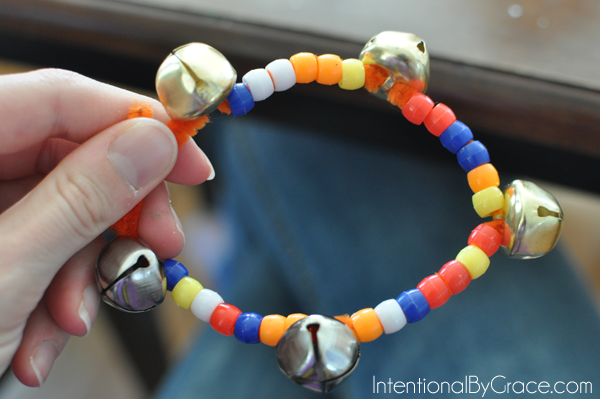 Make a Homemade Instrument – Using pipe cleaners, pony beans, and jingle bells, make a homemade instrument. Then dance to Christmas music together as a family! 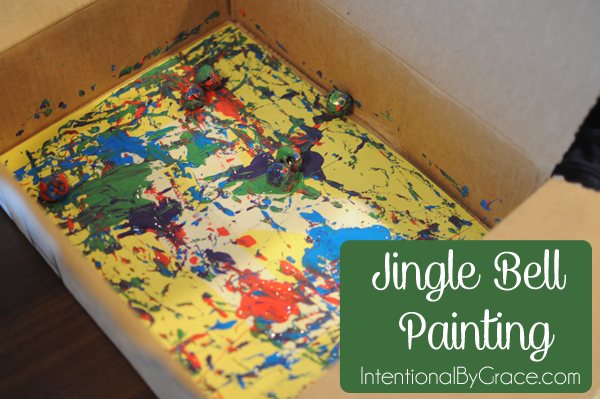 Jingle Bell Painting – This is such a fun activity! All you need to do is put some construction paper in the bottom of a box, squirt some paint and throw a jingle bell inside. Let your child shake the bell around the box. We sung Jingle Bells while we did the shaking part. 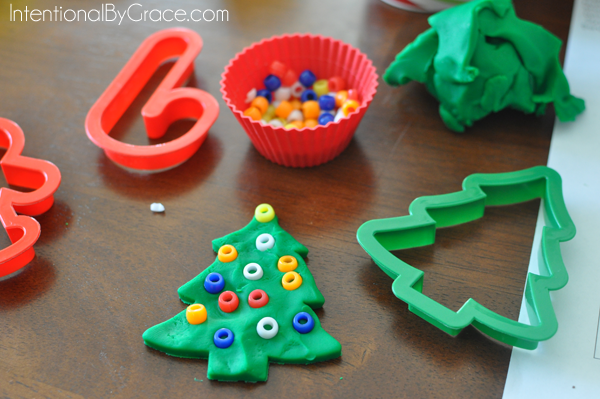 Christmas Play-dough Creations – Playdough is a regular part of our homeschool. 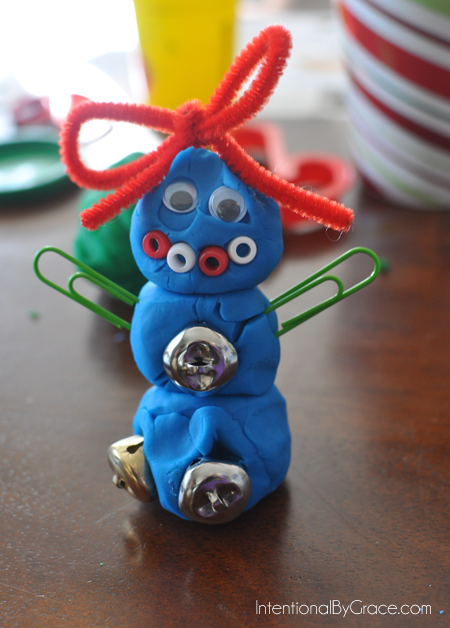 One day I pulled out the playdough, pony beads, jingle bells, paper clips, pipe cleaners, googly eyes, Christmas cookie cutters and whatever else I could find. We worked together to make as many Christmas themed creations that we could. It was a lot of fun! 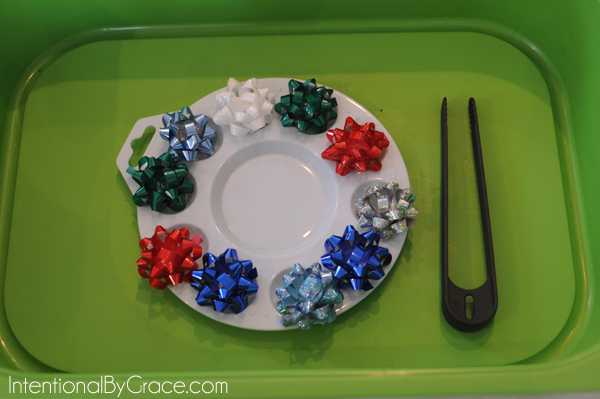 Christmas Bows Fine Motor Activity – Using small tongs have your child place the bows on the paint tray. 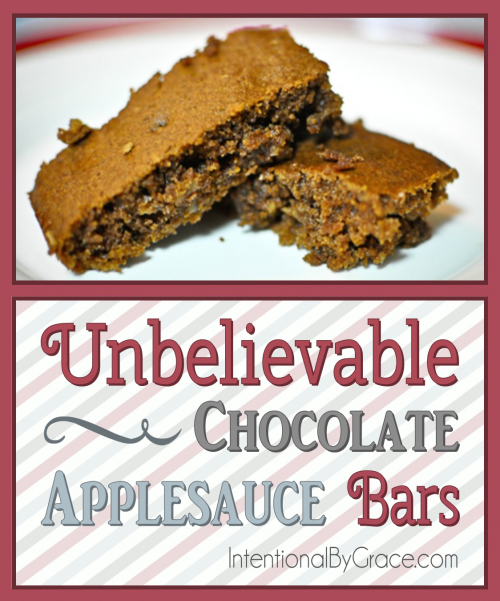 You could also have your child place them in egg carton or ice cube trays. We also worked on patterns with our bows. 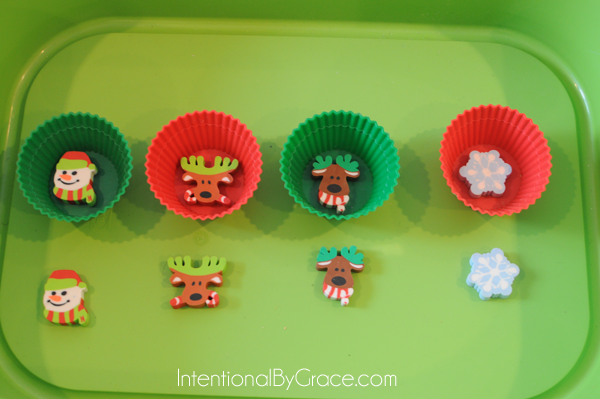 Creative Play with Christmas Erasers – Match the erasers was a fun activity one day, especially when we mixed it up with muffin cups to hide them. 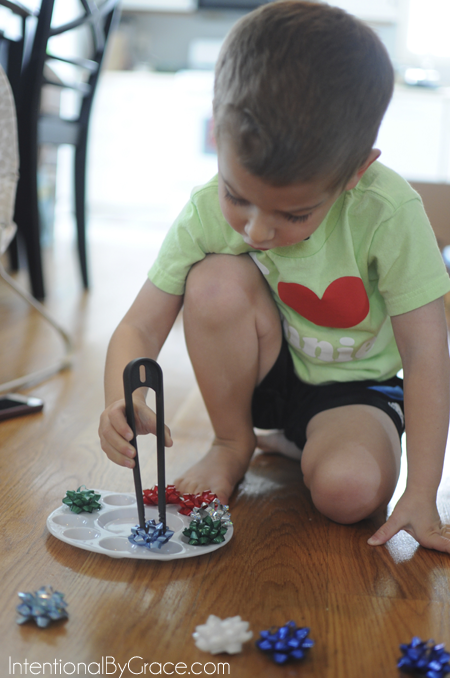 Fine Motor Practice with Jingle Bells – Using our shapes from our Lauri Stacker Pegs Building set, I had him place a jingle bell on each hole. Later in the week, we used our small tongs to do the same thing. 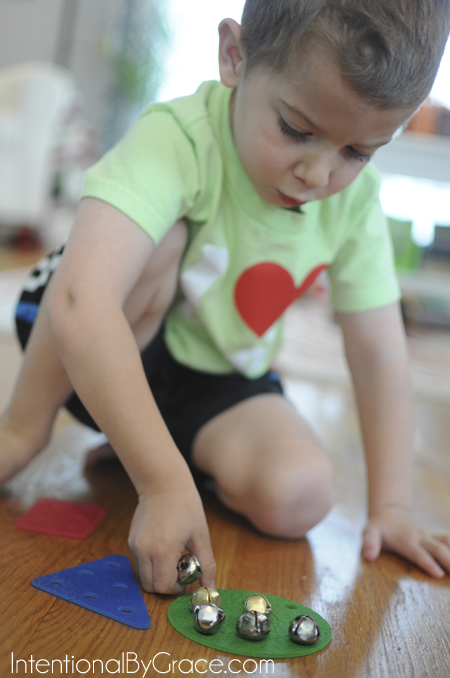 We practiced colors and shape recognition as well. 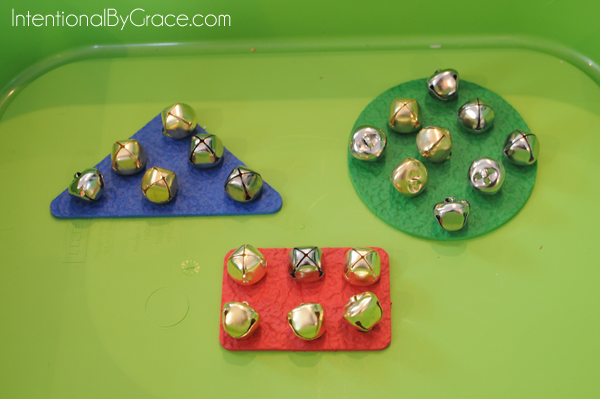 Christmas Tic Tac Toe – I snagged this from the dollar store and it was great fine motor practice. 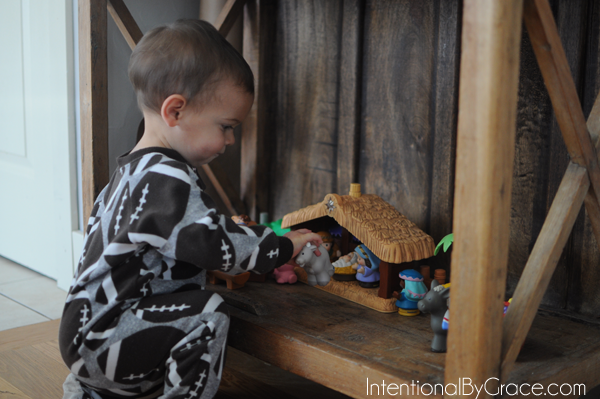 Nativity Scavenger Hunt – Set up a nativity set that your child can play with. 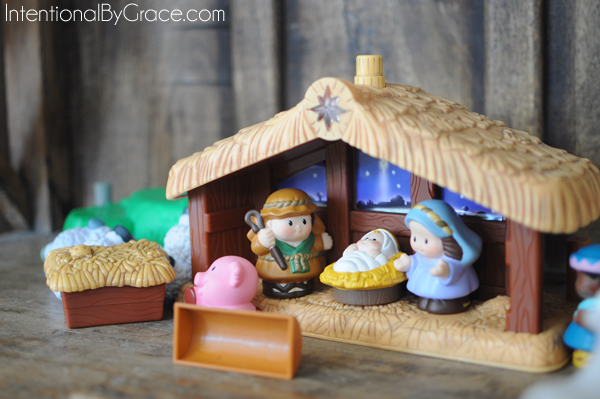 We love our Little People Nativity Set. 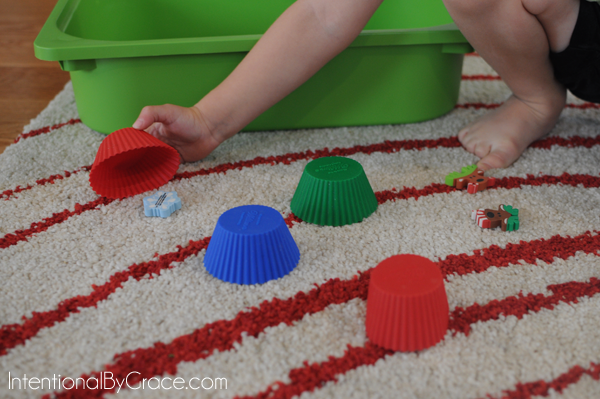 Hide the pieces around the room and have your child find them. 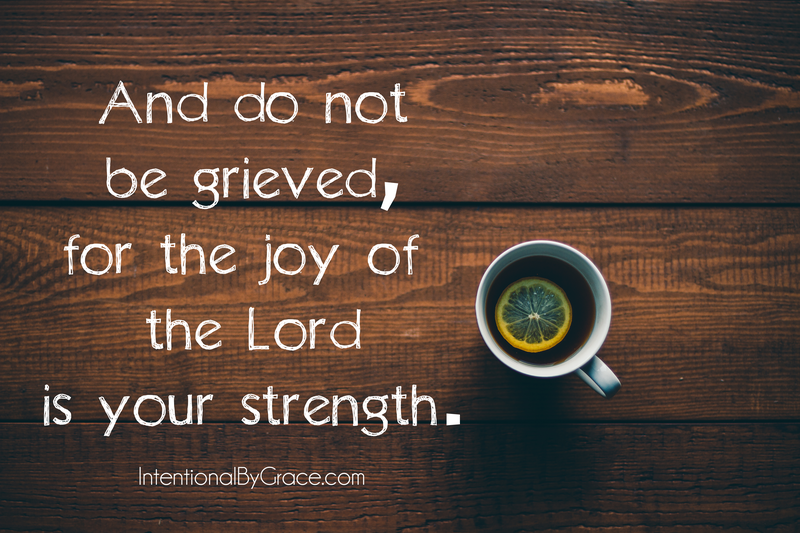 Tell the Christmas Story as you play. 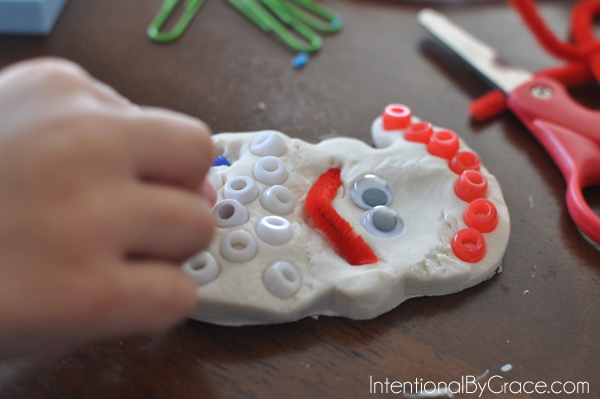 Build a Snowman – My mother-in-love sent a snowman making kit. 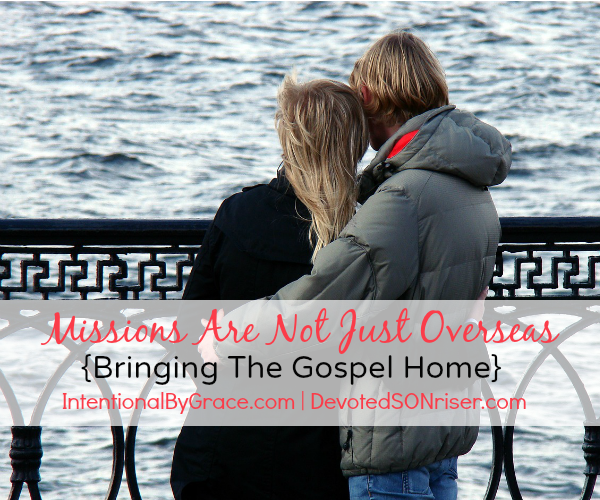 This was a fun family activity! 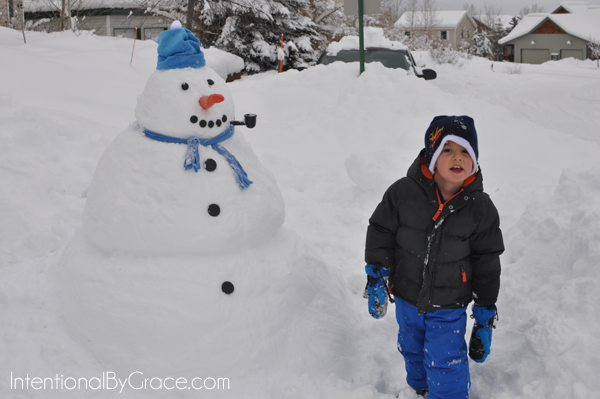 You don’t need the kit to go all out and make a fun snowman one day. 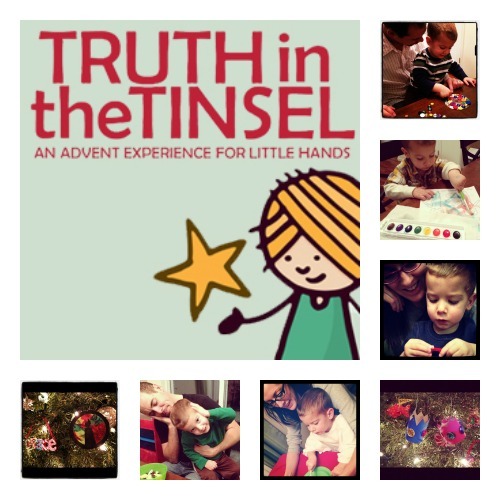 If you’re looking for a way to teach your children the true meaning of Christmas in a fun way, then I recommend Truth in the Tinsel. It’s been a great memory maker for us each year! P.S. I’m always pinning new ideas to my Christmas Pinterest Board!